SysmedIBD stands for Systems medicine of chronic Inflammatory Bowel Disease. 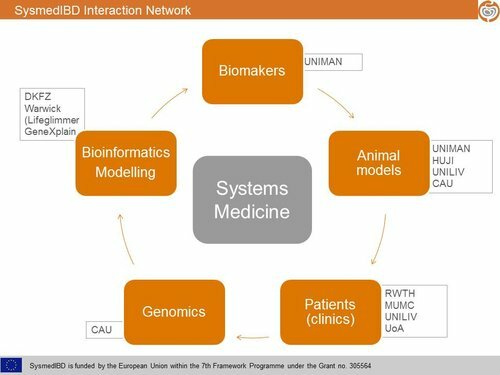 The main objective of SysmedIBD is to better understand chronic Inflammatory Bowel Disease and to find new approaches for therapies. Professor Werner Müller is available for interviews contact. Research funded from EU SysmedIBD grant brings new understanding of chronic inflammatory disease: Scientists at the University of Manchester have shone new light on the way cells tune in to different inflammatory signals to understand what is happening in the body. To read the whole press release please click here. Please find the press release of the Manchester University, announcing the kick-off of SysmedIBD, here. Please click on the picture to download the official Leaflet for SysmedIBD project.